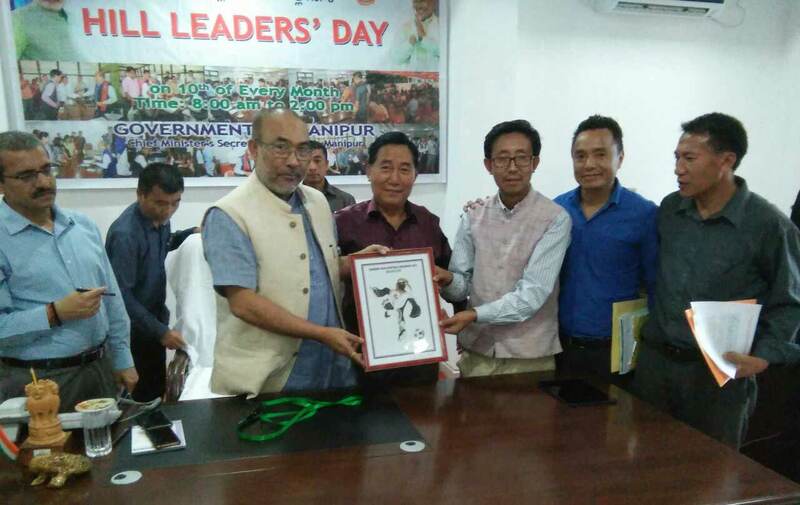 Chief Minister of Manipur N Biren Singh, recently launched the official mascot of the Tangkhul Naga Football Centenary, in a small ceremony held at his bungalow. The centenary, which will be held from December 5 to 18, is in commemoration of the 66th Labour Corps Football Team, France 1917. For the official mascot selection, an open drawing competition was organised on September 9 by the Arts and Literary Committee of TNFC. The competition received whopping forty-five entries from participants including students, young men and women. Winner Yarimei Keishing s/o Peter Keishing was awarded a cash prize of Rs. 10,000. The TNFC team highlighted the upcoming TNFC programmes that include Araang Football League; cultural, education, film and tourism carnivals; and marathon race. For this centenary celebration of TNFC, a lot of participants, as well as tourists from different parts of India and abroad, are expected to come in big number. The convenor of TNFC Sword Vashum stated that such celebration—of 100 years, will play a crucial role in the promotion of communal harmony, peace and development in the region. The Chief Minister also lauded the events as interesting and wanted to take sports to a greater height.